GableGotwals has announced the promotion of two associate attorneys and two of counsel attorneys to shareholder status. 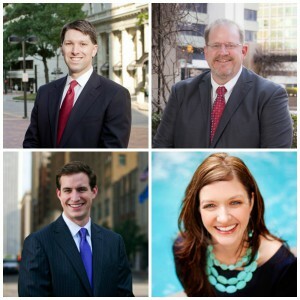 The new shareholders include Adam Doverspike, Robert Getchell and Brandon Watson who are located in Tulsa and Talitha Ebright, who practices in the Oklahoma City office. With over 90 attorneys, the Firm now has offices in Tulsa, Oklahoma City and San Antonio, Texas. Adam C. Doverspike focuses his practice on complex civil litigation, appellate matters, ratemaking, and local government affairs. Adam has represented a wide variety of clients, including pharmaceutical manufacturers, government entities, universities and energy corporations. Adam’s energy work includes preparing comments on EPA rulemaking concerning proposed hydraulic fracturing regulations and assisting a natural gas utility through the state ratemaking process at the Oklahoma Corporation Commission. He has counseled energy clients regarding environmental issues, eminent domain policies, data security and privacy issues, and the use of unmanned aerial vehicles. Robert J. Getchell has practiced Real Estate Law for over three decades in Oklahoma and Arkansas. His broad-ranging experience includes residential, commercial and investment-related real estate transactions. Having spent almost 20 years as staff attorney and general counsel for abstract and title companies, Bob has extensive experience in every area of transactional real estate including title examination, title insurance underwriting, sales and refinance transactions, contracts, conveyance instruments, encroachment agreements and easements. Bob is also an experienced litigator having represented various individual, investment and corporate clients, including some of the country’s largest banks, in mortgage foreclosure litigation and other adversarial matters covering a wide range of real estate matters. Brandon M. Watson’s practice focuses on business transactions, where he advises clients on matters relating to mergers, acquisitions, corporate governance, compliance with federal securities laws (including registered offerings and periodic reporting compliance), commercial and contract issues. E. Talitha Ebrite’s practice focuses on business litigation (State and Federal). Talitha has worked closely with large and small oil and gas companies, major retailers, and a number of other business entities to accomplish their goals in matters relating to class actions, revenue accounting, environmental claims, employment discrimination, and a broad assortment of other commercial disputes. A significant portion of Talitha’s practice is also devoted to drafting oil and gas drilling, division order, and acquisition title opinions.